Eugene, Oregon's top golf instruction school, is now offering Spring/Summer golf instruction classes for junior golfers, and women and men of all ages. Eugene/Creswell, OR – Locally owned golf instruction school announced today its’ summer schedule. The Kingdom of Golf, effective March 27, 2019, has programs for children, women & men of all ages. Most programs will be held at Emerald Valley Golf Course in Creswell, Oregon while some will also be held at The Kingdom itself. The Kingdom instructors, Debby King (LPGA/PGA Class A Member) and Nancy Woodke (LPGA Class A Member & U. S. Kids Golf Certified Coach) are expected to offer #InviteHER programs, #LPGA*USGA Girls Golf programs, #PGA Junior League programs which instill confidence in their customer base. In addition to all of these programs, instructors at The Kingdom of Golf are also available for private and group instruction. According to their students they are the best golf instructors in the Eugene, Oregon area. One of Debbie’s student said, “If you want to improve your golf game go see Debby. Very talented instructor. She will guide you through the learning process & get you on the road to satisfaction”. Nancy has worked with our son since he was 8. She is great with kids and always works to keep golf fun. She is amazing with beginners, but also has a wealth of wisdom to help kids who want to play tournament golf. If your kid wants to try golf, start with the Kingdom of Golf! Jeremy Piger said on his Google review. 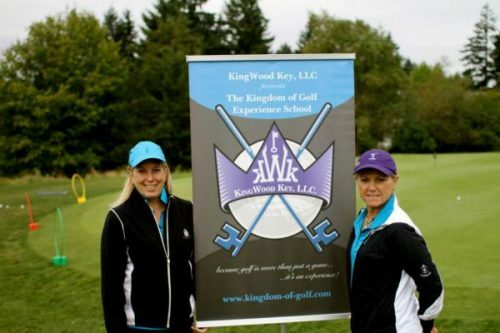 The Kingdom first opened its golf school in 2012 in Eugene, Oregon and is owned by Debby King and Nancy Woodke. It has enjoyed 7 years as an independent company to empower people to become their own best golfer. The Kingdom upholds its promise to stimulate interest in the game of golf…a game of a lifetime. Known for their award-winning instruction and fun nature, the company also intends to maintain its commitment to providing more than just a game, but an “experience”. For questions or comments about this press release contact The Kingdom of Golf Experience School via email at kingwoodkey@gmail.com. Contact Debby King at 541.743.3482 and or Nancy at 541.912.8012 Learn more about them on this video.